Panasonic has nailed its colours to the mast on high-definition disc formats and those colours are blue - well, Blu to be precise. Its first Blu-ray disc player, the DMP-BD10, is in the shops and a partnering AV amplifier that matches both cosmetically and technically makes a lot of sense. Enter the SA-XR700, an AV receiver as radical as Blu-ray tech itself. For starters you have to grasp a philosophy based on a no-interference policy on the video side but high-tech digital engineering and audiophile components on the audio. So while the SA-XR700 has simple pass-through 1080p HDMI connections without upscaling, up-conversion or even an onscreen display (no, really, it doesn't have an onscreen display! ), it does have very clever all-digital class-D multiple-amping technology and frankly wacky audio components such as Pure Water capacitors. Now, as The Oracle from The Matrix might say, this will really bake your noodle: The Advanced Dual Amp drive automatically couples any spare channels in parallel to the main front L/R amplification to boost dynamic headroom and, claims Panasonic, enhance realism and ambience in movie sound tracks. Better still, you can re-assign the surround back output to bi-amp the front channels and let the SA-XR700 Dual-Amp the bass output using the rear-channel power when you switch to stereo. 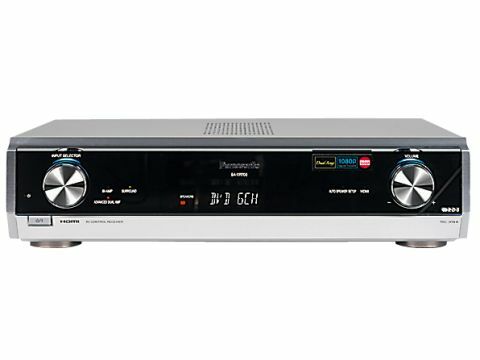 Hey, I warned you it was complex - but the clever upshot is that two-channel stereo output utilises nearly all of the Panasonic's combined power and headroom. The audio niceties continue with HDMI connections that offer full specification 8-channel PCM input from, of course, a Blu-ray player and 192KHz/24bit conversion of incoming analogue signals to a digital stream prior to amplification. The machine is also equipped with Panasonic's HDAVI control, meaning when connected to other HDAVI-enabled products, namely Panasonic's BD player and some TVs, they all work seamlessly from the same remote with plenty of one-touch features. The result of all this digital-ness is an amplifier the size and weight of a DVD player that runs as cool as a cucumber and yet is claimed to push some 560W of grunt when required. The SA-XR700 is set up with a supplied microphone and a full automatic setup routine - and that is about where normality ends. The video connectivity is going to be complex if you have several sources with different video formats and without an OSD you need to simply let this amp get on with the job and leave it be. Having seen amplifiers with more controls that your average space shuttle, this fire-and-forget approach makes me nervous - but it's bound to appeal to many. In 5.1 mode the SA-XR700 seamlessly switches to Dual-Amp operation on the front main channels and sets out its stall with a clinically clean sound. Disc-based hiss is enhanced but dialogue has an articulate clarity and high-frequency effects seem to have endless extension up the range. Bass is dry, tight and packs a lightning-fast punch - although there is none of the seismic scale bass of Yamaha's analogue models, nor the visceral energy of similarly-priced Denon receivers. A romp through the DVD collection reveals that the Panasonic has a certain predilection for some genres more than others. Stick on spooky and atmospheric works such as The Others or Event Horizon and you get an elegant sonic atmosphere with detail that is hard to fault. Likewise, period dramas and even comedy fares well as the finely-crafted dialogue glues you to the screen. But switch to more gung-ho action and the Panasonic all but derisively looks down its fascia at such low-brow entertainment and has a poor stab at creating edge-of-the-seat excitement. The bass is simply too tightly wrapped to generate the required adrenaline rush and the extended HF response begins to fatigue the ears after extended or high-volume listening. The SA-XR700's almost pretentious sophistication and refinement is squeaky clean - and not able to bury convincingly you in the muck and bullets. Two-channel music puts even greater emphasis on the Panasonic's preferential balance. Light choral, strings and female vocals are blessed with an air of delicacy and sheer accuracy that few AV amps manage at any price. Beverly Craven all but breathes into the room with superb articulation and ethereal soundstage. Switch to pop or rock and the balance is too cold with a severe shortage of passion or rhythm. This receiver is obsessed with meticulous detail and refinement. You can only salute Panasonic for its inventive approach to AV, but the result appears tuned by sophisticated test and measurement equipment rather than a film fan. It is an exercise in precision rather than passion and, while some may prefer such a pretentious stance, it's a philosophy that cuts little mustard with us. Add to this the severe shortage of features compared with similarly priced peers and a fairly hefty price tag, and the SA-XR700's appeal is perhaps limited to its cosmetic and operational pairing with Panasonic's Blu-ray player.